Everybody has the dream: Build a boat in the backyard and sail off to join the happy campers of Pogo Pogo, right? But how? Assuming you aren't independently wealthy, if you want a boat that is really you, you gotta build it yourself. With irreverent wit and an engaging style, George Buehler shows you how to turn your backyard into a boatyard. Buehler draws his inspiration from centuries of workboat construction, where semiskilled fishermen built rugged, economical boats from everyday materials in their own backyards, and went to sea in them in all kinds of weather. Buehler's boats sail on every ocean and perform every task, from long-term liveaboards in Norwegian fjords to a traveling doctor's office in Alaska. The book contains complete plans for ten cruising boats--from an 18-foot schooner to a 48-foot Diesel Duck. 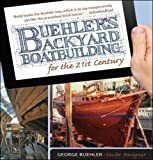 Jam-packed with photographs, helpful diagrams, and cost-effective techniques, this is a must-have reference for today’s boatbuilders or those curious "makers" tinkering around the backyard. If you want to build that boat of your dreams, you can't find a better guide than Buehler's.